The concept of mashing together chick lit and monsters was inspired leading to others like Abraham Lincoln: Vampire Hunter which was also made into a movie and Sense and Sensibility and Sea Monsters. Jane Austen's classic 1813 novel had been parodied by Seth Grahame-Smith in 2009 and was immensely popular. Director Burr Steers (Charlie St. Cloud and 17 Again) who also wrote the script leaving out some elements from the book, but keeping some of the original popular romantic Jane Austen scenes, with some swords and guns in between. It's kinda like a Cliff Notes version with pictures of Zombies added to the sides of the pages. It makes for an interesting, sometimes amusing but very uneven story. In this alternate universe, Regency England has been hit by a plague that causes those stricken to die, rise from the dead and seek out brains to eat. London had built a wall around it, then a canal was built which makes the land from the wall to the canal called the “inbetween”. There is only one bridge to connect them from the rest of the country which has learned to live with an occasional out break of bitten by everyone of class and breeding being trained in Japan to use the sword. Mr. Bennett (Charles Dance) had his family of 5 young women Shaolin Temple-trained in China. Outside of the sisters training with each other they still live like typical young women of their day, with their mother (Sally Phillips) trying to secure marriages for them with well to do young men. Even if these women warriors can hold their own with a horde of undead, they still cannot inherit their family's land or wealth. The set up with sisters Jane (Bella Heathcote) and Elizabeth (Lily James) meeting the dreamy Mr. Bingley (Douglas Booth) and the dour Mr. Darcy Riley) is still the same. As is the conflict with with Darcy and Mr. Wickham (Jack Huston). Matt Smith practically steals the movie as Parson Collins, the cousin who is due to inherit the Bennett estate and marry one of the sisters. He's delightfully annoying. Lena Headey plays the Lady Catherine de Bourgh who is also the baddest kick@ss woman warrior in the land with a patch on one eye, who challenges Elizabeth because her sickly daughter is supposed to have been betrothed to Darcy. The book probably adds more details to the story. The movie quickly moves without explanation of why the infected can still talk and act like humans. Supposedly eating human brains will make them into monsters. The movie starts with Col. Darcy seeking out an infected at a high class whist party, then quickly dispatching it, finishing it off by smashing it's head leaving the guests to clean it up. It's like people are just inconvenienced, rather than horrified. 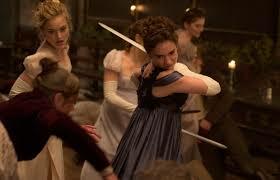 The fun parts are when the Bennet sisters gear up for a fancy ball, then battle attacking zombies with their hidden swords. One moment they are discussing romance and flirting, the next they are knee deep in carnage. There's some four horsemen who are supposed to foretell doom, but that element is never explained. Overall, the movie is kinda fun, but somewhat brainless.